240 pages | 37 B/W Illus. Zoonotic diseases – pathogens transmitted from animals to people – offer particularly challenging problems for global health institutions and actors, given the complex social-ecological dynamics at play. New forms of risk caused by unprecedented global connectivity and rapid social and environmental change demand new approaches. ‘One Health’ highlights the need for collaboration across sectors and disciplines to tackle zoonotic diseases. However, there has been little exploration of how social, political and economic contexts influence efforts to ‘do’ One Health. As stated by the Centers for Disease Control and Prevention, One Health is the concept that human health is directly linked to the health of animals and the environment. Thus, collaborative approaches among veterinarians, ecologists, physicians, and public health practitioners are needed to address public health threats. In this volume, the editor provides a comprehensive background for the development and evolution of collaborative approaches to managing disease outbreaks. 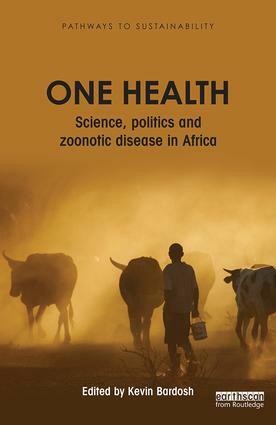 However, instead of focusing on the development and success of the One Health approach, contributing authors provide evidence of disconnects among policy makers, scientists, and people affected by disease. Therefore, the contributors often argue for an expanded role of political and social scientists in the One Health narrative. The book tends to use terminology typical of health practitioners and ecological professionals. This deems the work appropriate for advanced undergraduate students, graduate students, researchers, and health professionals working in or interested in disease outbreaks and public health issues and the social and political implications for control of disease. Kevin Bardosh is a Research Fellow at the Division of Infection and Pathway Medicine, University of Edinburgh, UK.